Curries are a must in every Goan home & we definitely cannot do without it. Most people think that our curries are not only red hot but we prefer red curries but this is not true. We love green curries too. In my home I make red as well as green curries especially with coconut milk which everyone enjoys but my elder son loves the most! Just the other day we got home some really fresh King Fish (Surmai). The whole fish was quite large & I made quite a few favorite dishes with it. I had fresh green coriander & some coconuts from Kerala given by my good neighbour. These two ingredients were just ideal to prepare a nice, green & refreshing curry. 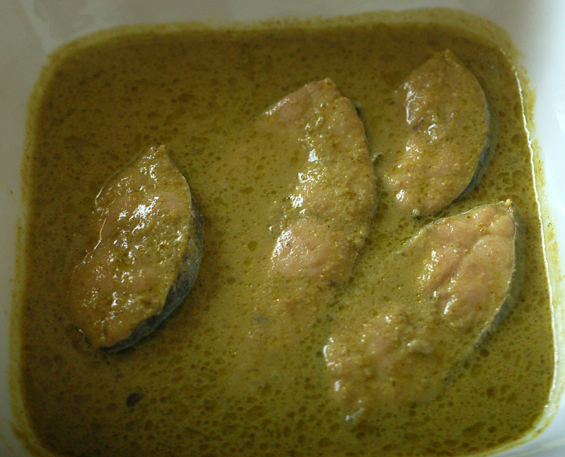 I also had lovely thick fresh slices of fish which I realized would make an excellent curry. I cooked the Green Fish Curry in a mud pot which turned out very delicious. Wash the fish slices & apply some salt & a little turmeric. Keep aside for about 15 mins. In a sufficiently large pan/dekchi/handi or mud pot, heat oil & sauté chopped onions till they are cooked, soft & translucent. Add the above prepared masala paste & stir to cook on low heat till rawness disappears & you start getting a good aroma. Then add the reserved masala water & let it come to a boil. Add slit green chillies, a pinch of sugar & the tamarind paste/extract & stir well. Gently slide in the fish slices, evenly distributing in the pot. Do not stir. Let it cook on med. heat for about 2 mins. First pour in the thin coconut milk & give it a gentle stir. Next add in the thick coconut milk & stir gently again. Add salt to taste, stir once again & check the seasoning & add water if necessary depending on the thickness of the gravy you desire. Let it simmer gently on low heat for another 2-3 mins. till the fish is just tender & the gravy thickens. Do not overcook the fish. Serve hot with plain rice or Goa boiled rice. can i add prawns in this?